Such parodying of his own image was something Duke happily cooperated in. 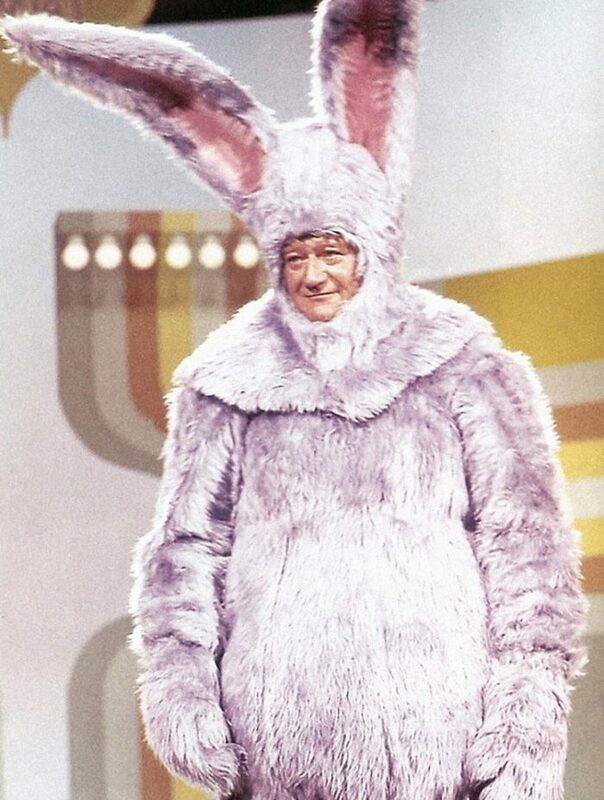 It was, in fact, one of 15 times that John Wayne appeared on what was, back then, considered a hip, counter-culture, youth-oriented show between 1968 and 1973. Since this month would have been Duke’s 110th birthday, we thought it appropriate to pause and remember him as close family and friends do—a fun-loving, practical-joking guy whose “sense of humor is vast,” according to a profile of him written by journalist Wayne Warga while Duke was promoting Rooster Cogburn. It’s also instructive to examine his use of humor over the years, often strategically. Indeed, John Wayne, despite his image, gruff exterior, and passionate beliefs, was never above poking fun at himself and others he was close to, both on camera and off. On camera, for instance, Laugh-In was just one of dozens of comedic television shows he guest-starred on between the 1950’s and the 1970’s. In fact, the greatest cinematic tough guy of all time goofed around on sitcoms like The Beverly Hillbillies (1967), I Love Lucy (1955), The Lucy Show (1966), and Maude (1974), and a huge range of comedic variety shows with the likes of Bob Hope (six TV specials), Dean Martin (four Dean Martin TV roasts and one variety show appearance), Don Rickles (one), Jack Benny (one, plus a tribute program to the great comedian), Jimmy Durante (one), Milton Berle (one), Red Skelton (twice), and Jonathan Winters (once), not to mention appearing on People are Funny with Art Linkletter (1957), The Super Comedy Bowl (1971), and six times with Johnny Carson on The Tonight Show between 1971-76. His Archives also include the speech he gave in December of 1974 to the National Football Foundation and College Hall of Fame. Some of the material he used that night included, once again, making fun of himself and his acting career. And Duke wasn’t above playing such stunts on his own family either. According to his youngest daughter, Marisa Wayne, in a story she related in an issue of the Official Collector’s Edition John Wayne magazine last year, Duke once went out of his way to pull a fast one on her sister, Aissa, and Aissa’s friends. Marisa said that when Aissa brought some friends with her to a house the family was renting in London during the filming of Brannigan, the young girls were worried the old house was haunted. However, John Wayne’s oldest surviving daughter, Melinda, points out it was a lot harder to successfully play a practical joke on her father than to fall prey to one. During the making of McClintock, she recalled showing up on set in Arizona to surprise her father. She had a wardrobe person dress her in a Native American costume, with her face covered, to stand in line with other extras and get an autograph from her father. Duke seemed to instinctively understand that humor can bring people together regardless of beliefs or circumstances, and he was certainly in favor of bringing people together. When the satirical publication Harvard Lampoon invited him to do “battle” over political ideologies in Boston in January of 1974, while he was in town to promote McQ, Duke not only accepted, he used the occasion to win over his younger, liberal audience using his characteristic good humor. Later, he wrote the Lampooners a friendly thank-you note and told family members that the event, coming at a time when his health was in decline, made him feel better than he had been in months. Melinda chalked that result up entirely to humor. “Those students wanted to murder him politically, and instead, he made them laugh,” Melinda points out. One can only imagine what kind of one-liner Duke would have cracked today at the thought of suddenly being 110 years old, but there is little doubt he would have had a good one ready.